Suppose 9/11 truth became part of the contest between the two major political parties. The partisanship wouldn’t be pretty, nor would truth be served particularly well. Moreover, if I had lost a family member that day, I can’t say I would want to see a controversy like that come up. Still, I wonder if we might not consider it a breakthrough if we found we could talk about the subject in public. 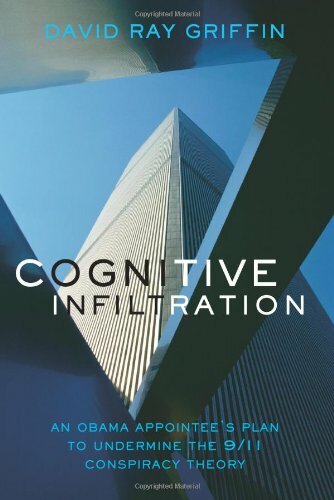 Cover of David Ray Griffin’s book, Cognitive Infiltration. Griffin doesn’t go against only weak opponents, either. Cass Sunstein is a capable legal philosopher out of the University of Chicago, and Griffin makes him look foolish and unprepared, like a student who did not do his homework, as a matter of fact. See his work in Cognitive Infiltration: An Obama Appointee’s Plan to Undermine the 9/11 Conspiracy Theory. To his credit, Griffin doesn’t try to make Sunstein look that way, but what do you do when you encounter a weak, ill conceived, even reprehensible argument that deserves rebuttal? Socrates skill in argumentation made his opponents look foolish; his prowess won him a death sentence. I wonder how Sunstein felt when he read Griffin’s rebuttal? Not comfortable, I’m sure. Here is advice from one 9/11 skeptic: find out who, and the how will follow. That is, find out who is responsible for the 9/11 crimes, and details about how the criminals destroyed the buildings will become clear. The difficulty is, evidence about who committed the crimes is the hardest to get. It is secret, and in the hands of people who will not give it up. Griffin is clear as well about who should conduct the investigation: Congress or the press. The executive branch had its chance with the 9/11 Commission and failed. The Commission’s report felt like its infamous predecessor, the Warren Commission report: inaccurate, incomplete, and insufficient. Even though the crime was far more complex than Kennedy’s assassination, the 9/11 Commission report is much shorter. It does not even address the most glaring evidence of foul play, the destruction of World Trade Center 7. Like the Warren Commission report, it overlooks innumerable other pieces of evidence, all of them significant and in need of analysis. Incredibly, George W. Bush resisted requests from victims’ families for an inquiry for over a year and a half, as evidence grew cold, or was scattered and destroyed. When the Commission wheeled out the results of its work, people who had taken an independent look at the matter could not contain their criticism. One would want to snicker, if the crime were not so serious. The 9/11 truth movement wants a report that does justice both to the evidence and to the truth. A board of inquiry appointed by Congress would have the independence, resources, skills, and motives to investigate 9/11 properly. In good faith, professional journalists would bring the same qualities to investigations they conduct. Either institution – or the two working along parallel tracks and in their own ways – could produce work superior to the report the 9/11 Commission produced. That is the reasoning behind this proposal. To see why the reasoning is flawed, see A New Investigation. The only people who can conduct valid research about 9/11 are independent researchers who have already undertaken it. They need encouragement, support, and new recruits to continue this essential work. Just as important, we ought to keep demanding that government release information about 9/11 that it guards so closely. Government officials know instinctively that their authority will evaporate if they resist these demands indefinitely. Meantime, independent researchers have to keep at their work. They are the only ones with integrity, skill, and motivation to succeed.